I have been so awful with regards to my health and fitness since getting back from Santorini at the beginning of last month. I have been scoffing so much junk food, and being generally greedy with my food as I’ve been feeling quite anxious and under the weather. I have also been suffering with bad cramps in my stomach and most of the time all I want to do is crawl up in a ball and avoid moving too much. This has meant I have barely done any exercise for the past few weeks and it’s really started to take a toll. I feel so lethargic and just generally rubbish and I’m sure it’s down to not exercising and getting those all important endorphins. I’ve felt like I haven’t had the time to do my exercise DVD now that Benjamin is so much more active but in reality, I’ve just been avoiding it and making excuses. I’ve been awful lately whilst feeling anxious and low. I tend to ask Ed to buy snacks at the shop and then sit and eat them in bed at night, but I have also been getting bad things during the day with my mum. Not good! A cliche but I really haven’t been eating as many vegetables lately and I’ve been avoiding buying as much fruit as I usually do as well because of the cost but it’s so important to eat them! I was pushing myself a little too hard before the wedding and exercising up to 7 days a week. I don’t think this is necessarily healthy or attainable for me so I will be trying for 3 times a week, hopefully four. This means I get some rest days but will make a big improvement with my fitness after a break. This one should actually be fairly easy to do. Since Ed started his new job, I’ve actually given up the car most days in the week and so I am being forced to walk more. I always did the school run on foot as it is so close, but I have been walking further afield so that he can have the car to get to work each day, and it’s making me get some fresh air and exercise, which is great! 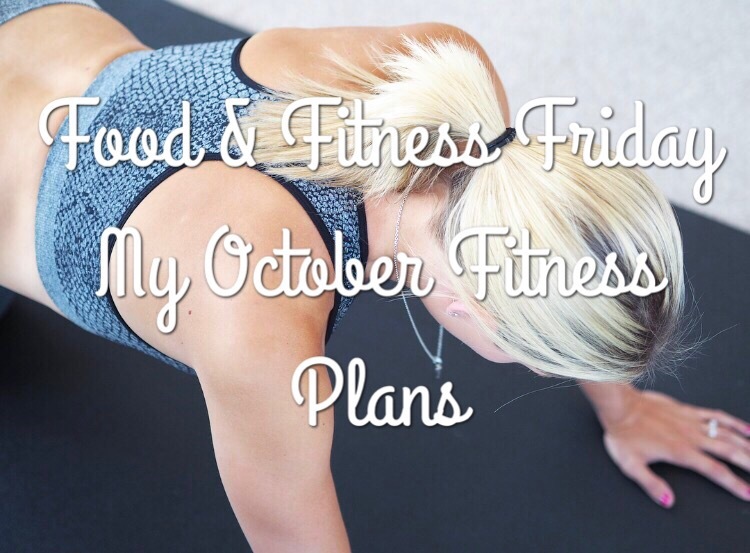 Do you have any fitness or healthy eating goals this month? It’s so great to get back on track! I just started exercising again this week and i feel so much better! I also noticed that in the past I used to force myself to exercise in the morning. But now that I do it at night, I feel much more confident that I can stick to exercise! With it getting darker earlier it definitely takes it toll on regular routines and makes you want to do a lot less and stay indoors more!! I need some motivation to get back into eating better and getting out more, also chocolate pancakes sound so good! Haha. I do love my fruit though, I agree it is expensive, especially for how long it lasts! I feel like it’s so much harder to stay motivated when the weather gets colder and all you want to do is get cosy and comfort eat! I really need to get into a fitness routine, I’ve just quit the gym so need it now more than ever! I recently moved somewhere that has a gym upstairs – I definitely need to be better about exercising regularly! Since I moved out I’ve been cooking a lot more and trying to eat healthier and I think it’s working well so far! I’ve been trying to do Kayla’s BBG program and I like it a lot! This is so motivating and great fitness plans. I need to up mine. I trust your October has gone well so far and that you are having success in your plans! Great goals you have!!! I’ve recently taken up yoga on my days off, so that I’m giving both my mind and body some gentle love. Plus — there are tons of great videos online that I can do from home. I think we all overlook the importance of setting specific and attainable goals! I love that you realized that 7 days a week isn’t necessary and that 3 days a week will suffice. Great advice! Great article, keep up the great work. Excellent inspiration for this dreary time of year!